How about McCormick to Spice Up Your Life? Why would someone choose to collect spice containers? 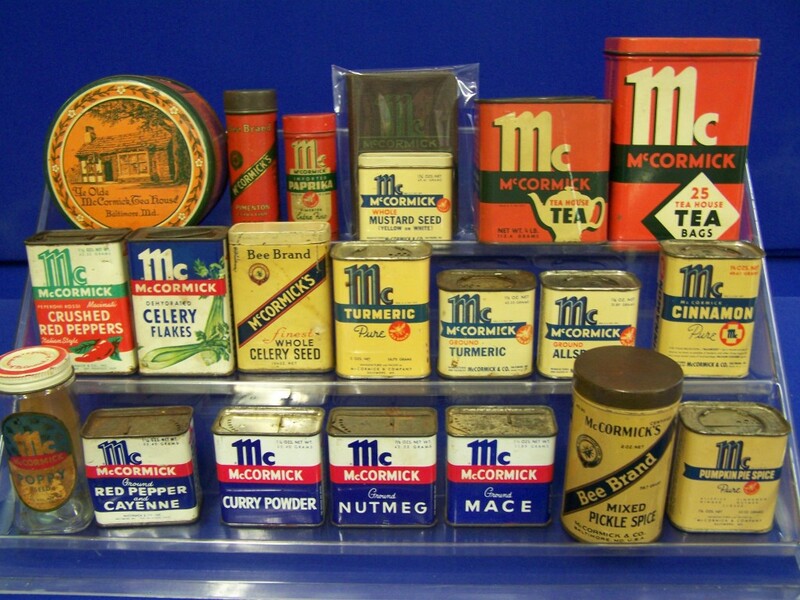 Vintage spice tins are very collectible, especially vintage McCormick Spice Tins around the Baltimore area. Many are drawn to the old time graphics often included on old spice tins. The classic colors and designs are a great addition to your home décor. A feeling of nostalgia warms our hearts and warms our homes! An old McCormick’s tin may remind you of Grandmom’s house, and that sentimental feeling can be very pleasurable. Why not place it somewhere prominent as a daily reminder of good times and good people. Others collect tins that showcase their name, first or last. If your first name is “Ginger” you are in luck! There are lots of choices to choose from in terms of Ginger spice tins: many different brands, various time periods. Last names or nicknames can often be found on old advertizing tins. Hunting for them is half the fun! 1904 – Most of the company’s assets and records were destroyed in the Great Baltimore Fire. Within 10 months, a new five-story building was erected on the old site. 1905 – The brand name Clover Blossom was established for the spices and mustard, and Bee Brand tea was made. 1921 – A new home for the “House of McCormick” was built at the Baltimore harbor. 1937 – New “Tea House Tea” trademark was developed. New metal containers developed for spice line, one of the packaging changes that won seven national packaging awards for McCormick in the next two years. 1971 – McCormick Division expanded operations by opening its Hunt Valley Plant. 1990 – A subsidiary of Hanson Industries sold its interest in the OLD BAY brand of products to McCormick. OLD BAY is now sold in both retail and food service size packages. 1999 – McCormick stock began trading on the New York Stock Exchange.